TECHNICAL CONSULTING INTERNATIONAL (T.C.I.) M89-SR / ISRAEL FOLLOWING INFORMATION IS FROM: THE ISRAELI SPECIAL FORCES WEAPONS GUIDE (www.isayeret.com) "The Technical Consulting international (TCI) Model 89 Sniper Rifle (M89SR), is an Israeli made bullpup version of the American made M14. The weapon was first introduced in the mid 1980?s as the Sardius M36 Sniper Weapon System (SWS). Like the Israeli military industries (IMI) Galil Sniper Rifle, that was also introduced at that time, the M36 SWS was another potential competitor for replacing the Israeli modified M14 SWS, then the standard issue SWS for long range sniping in the Israeli Defense Force (IDF). 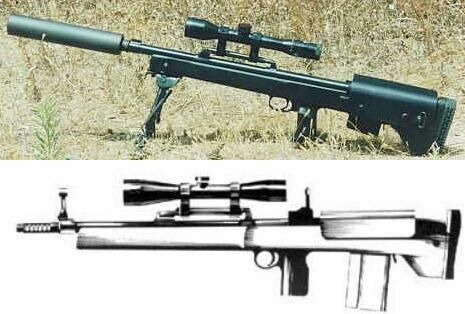 In the tests conducted by the IDF in the late 1980?s, the M36 was tested head to head with the IMI Galil Sniper Rifle and the M14, and prevailed by far. The M36 was very accurate, reliable and compact in size, so the IDF placed an initial order for 1300 units of the M36 to be purchased. Unfortunately, the Sardius Company failed to prove it had the proper financial and technical resources to produce such a mass quantity and the IDF's order was aborted. Eventually neither the Galil Sniper Rifle nor the M36 SWS managed to replace the M14 in the IDF, and the M14 stayed in its role as the main IDF's SWS, up until a decade later in 1997 when it was finally replaced by a real bolt action SWS - the M24. In the early 1990?s Sardius went out of business and the TCI Company got the licensee to produce the M36 SWS. The weapon had undergone heavy modification, including a new carbon fiber stock, and was reintroduced as the M89SR. As a bullpup version of one of the most accurate assault rifle ever made - the M14 - the M89SR is a pleasantly surprising very accurate semi auto rifle, which is well capable of 1 MOA groups, even with the IDF standard issued IMI M852 168 grain Sierra round. With proper match ammunition like the M118LR 175 grain round, the M89SR is even cable of 0.75 MOA. Its bullpup design allows the M89 to utilize a relatively long fully floating barrel (56 cm in length), while maintaining a very short length. The M89SR length is only 85 cm (103 with a sound suppressor mounted), hence much shorter then assault rifles not to mention from other much longer conventional shape SWS. Fully loaded with a M14 20 rounds magazine, the M89SR weight is only 6.28 kg, (7.03 kg with a sound suppressor mounted). Its combined compact size and weight provide the M89SR SWS with a very potent concealment feature, allowing it to be carried concealed very conveniently until the actual operational deployment. Eventually only 50 M36 were bought by the IDF. The M36 short length, combined with its inherent strong firepower, due to the original M14's 20 7.62 rounds magazine used, made it an ideal SWS for units with prior concern being concealment. So the few M36 purchased were mainly issued to the two IDF Special Forces (SF) undercover units operating at the time - Sayeret Duvedevan (Unit 217) and Sayeret Shimshon. Today, part from few samples, all the original 50 M36 SWS bought by the IDF in the late 1980?s, were put out of service mainly due to lack of proper maintenance. The IDF still use a very small number of M89SR, which are again used mainly by Sayeret Duvedevan. Unfortunately, due to the U.S. American Foreign Military Support (FMS) to Israel, most of it has to be spent back in the U.S., the chances of the IDF or any other Israeli security organization, procuring critical mass of this superb of its kind weapon, are slim to none. However, the M89SR is sold quite successfully abroad, mainly to SF units."